Return time is the date of departure from the resort airport. Description: Enjoying harbour views with easy access to the beach and resort centre, this family hotel has a wide range of facilities. 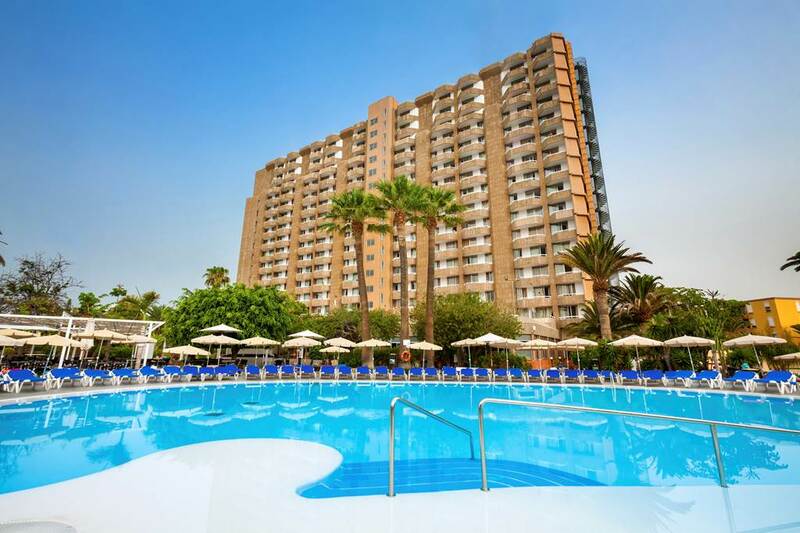 Relax and enjoy the free-form pool area for soaking up the sun, or take a stroll to the Los Cristianos harbour. There are plenty of activities to keep you amused while the little ones enjoy the children`s club and some great entertainment too. With a range of board options this hotel really has something for everyone. Inflight meals are not included in the cost of this offer but snacks are available to buy onboard the aircraft. Buffet. Serves breakfast, lunch and dinner with show cooking. Highchairs, microwaves, kids menu and kids buffet available. Pool bar showing live sports (open between 10.00am and 12.00pm). Serves food. Sports bar showing live sports (open between 01 Oct and 31 May, between 6.00pm and 1.00am, depending on occupancy). - 2 outdoor pools including children's pool (freshwater). - Outdoor freshwater pool. Sunbathing area with sunbeds and parasols. - Outdoor freshwater children's pool. Sunbathing area with sunbeds and parasols. Baby-changing facilities are available. - Gym (min age 18yrs). - Aerobics, pool table*, aqua aerobics, climbing, darts, mini-golf, petanque and table tennis. - Daily daytime entertainment including racket sports, small team games, team sports, family and water-based activities. - Daily evening entertainment including bingo, in-house entertainment shows, karaoke, live DJ, live music, mini-disco, professional shows, quizzes and rep cabaret. - Children's club (5-12yrs) - arts and crafts, small team games, sports and water-based (open between 01 Jun and 30 Sep, between 10.00am and 3.00pm, depending on occupancy). - Reception - equipment for hire includes fan*, kettle*, motorised scooter*, pushchair* and wheelchair*. Services available include currency exchange*, luggage storage and motorised scooter charging. If you want to book this offer, you can do so with your credit card through our secure server. You must read and agree to our Terms & Conditions before you can book. If you would like further information or wish to book this offer, please call.